Spring has sprung, and that means longer, warmer days and more chance to get out riding in the open air. The cold weather and lack of grass that comes with winter means that most horses will generally have been stabled for the majority of the last few months, so the change of season brings with it a change of lifestyle for both you and your equine friend. Even if your horse has been out and about throughout winter, there are still a number of adjustments in their care that you need to make, as each new season has its own unique set of challenges. With that in mind, here are some of our spring horse care tips to help you and your horse make the most of the warmer weather. If your horse has been stabled for the winter, it may seem a great idea to let them go out into their paddock, get their head down and feast on the fresh spring grass – but be careful. Spring grass is particularly sugar rich and full of moisture, while lacking in fibre, and it is very easy for horses to overgraze. Too much of an intake can lead to problems like laminitis, a painful and debilitating inflammation in the hoof that can potentially be very serious and lead to them becoming lame. Make you sure you monitor and limit your horse’s grass intake, and continue to offer hay in the early months of spring. Some horses are particularly susceptible to laminitis, so fencing off a smaller, less grassy area for them to use is a good idea to restrict their intake. Sometimes a grazing muzzle can be useful to prevent your horses from overgrazing, while still allowing them to socialise with others. It’s likely that you and your horse have been riding less frequently through winter, so it’s a good idea to take things slowly as you get back to riding. Schedule steadily increasing work to bring both of you back into condition. It’s best to start with short and easy rides, making sure there is plenty of warm up and cool down time, before gradually increasing into longer rides and exercises that are specific to your discipline. Little and often is the name of the game to begin with. Try too much, too fast, and you’re risking injury or worse. The resumption of exercise is a good time to evaluate your horse’s condition – as much as anything, you may need to check the fit of the saddle, since we’re not the only ones who can gain a few pounds over the winter. On the other hand, weight loss can also be an issue over the winter, so check by feeling along your horse’s neck, withers, shoulders, rib cage and back. Generally, you should be able to feel, but not see, the ribs of a horse that is in moderate condition. If you can feel individual ribs more easily now, you should begin adjusting their feeding schedule in order to improve their weight condition. Even if your horse is still in good condition after the winter, you should still take the time to evaluate their feeding schedule. If you’re going to be greatly increasing your horse’s level of exercise then their energy requirements will also increase, so you may need to include more grain or a high-fat ration in their feed. It’s all about ensuring balance – for horses that are ‘good-doers’ then a low-calorie feed balance is ideal, so they get the nutrients they need without gaining excess weight. With longer turn out times, some horses can become lethargic – so a slow release energy product may be beneficial. Just remember, any modification to a feeding programme should be introduced gradually. Blend the new feed with their current feed to begin with, so the horse can adjust to the new regimen. 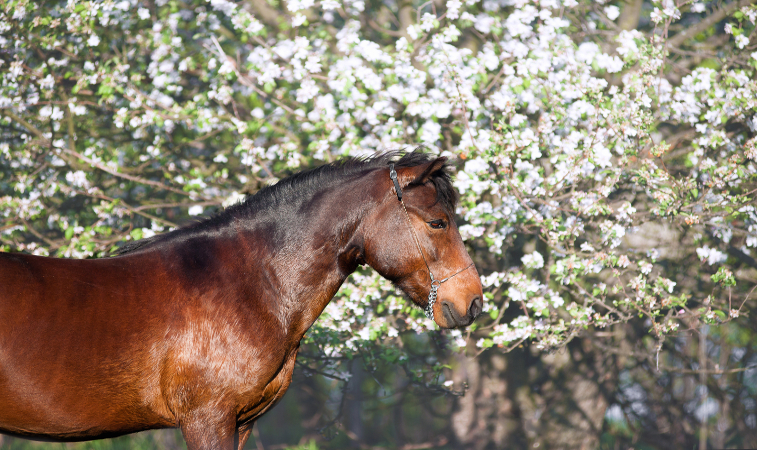 Spring is a good time for a health MOT for your horse. Get an equine dentist to check their teeth – horses should have a dental check-up at least twice a year. If their teeth are too sharp then the bit won’t sit properly in their mouth, and this can lead to training problems like head tossing and fidgeting, as well as painful mouth sores that can lead to a loss of appetite. Make sure that your horse’s hooves are shod correctly before beginning any spring training. Whether or not they were barefoot in winter, it is a good idea to have a farrier check your horse’s feet extra carefully. A horse’s hooves grow more slowly in the winter, and in the spring they can become cracked and dry, so use moisturising hoof oils to combat this problem. Finally, think about the kind of work the horse will be doing in the coming weeks and months, and the terrain they will encounter. Discuss with your farrier whether they will need studs for soft ground, pads for hard and rocky terrain or special shoes for any injuries. Again, remember to break them in gently, as their feet could be quite tender if they’ve spent the last few months without shoes on. Give them a few days to adjust to the feeling of having shoes again. As your horse sheds their heavy winter coat, check them for any cuts or other problems. Even if you’ve been grooming them carefully and daily over the winter, some small injuries may have been hidden by long hair. As soon as the weather is warm enough give the horse an all-over bath, and look for rain-rot, ringworm, and other conditions that may have been encouraged by blankets and damp weather. If your horse was constantly bundled up during the winter then they may also have developed a few blanket rubs. Before riding, make sure any rubs aren’t near the saddle – if they’re too close then refrain from riding and try lunging instead until they’re healed. Soothing aloe products can help heal the skin. Spring horse care means checking your vaccination records. Make note of what shots were administered last year and ask your vet what spring shots your horse will need this year. Their recommendations will vary based on a number of factors, including age, location, and travel schedule among others. It’s also important to start or continue a schedule of de-worming. Regular de-worming is vital for your horse’s health, and with the weather turning warmer and damper in spring it’s essential that you stay on top of this. Send off your horse’s droppings for a faecal check and worm count analysis, and plan a worming schedule accordingly. Again, consult with your vet if you are at all unsure about the best products and schedule for your horse. Ensure that you check all your fences for winter damage. Freezing and thawing can result in posts ‘heaving’, having loose mesh, or no longer have high tension. Make sure you take the time to re-stretch these worn-down fences, as it can be dangerous for your horse, who could easily get tangled in loose wires. Walk the pasture and look for any hazards, from litter to holes and low hanging tree limbs that may have been missed while your horses were stabled during the winter. Clean water troughs and check for sharp edges. Check thoroughly for poisonous weeds – some may have grown over the winter, but also keep in mind that as the spring grass grows, so too will the plants that can harm your horse, so this should be a regular job throughout the year. Spring brings with it temperamental weather conditions – this means rain, which in turn means mud. You can’t really avoid mud developing in the paddock, especially in areas that see heavy use, such as around water troughs – but you should make sure that your horses aren’t standing around in mud too much of the time. It’s not healthy for horses’ hooves to be wet for too long, as it can lead to thrush, a nasty bacterial infection in the hoof. The best way to avoid this is to pick out your horses’ feet daily. If wet, sticky mud stays on the back of a horse’s leg for too long then bacteria can start to grow, leading to their legs becoming swollen and scabby, a condition known as mud fever, so make sure to wash this off as often as possible. With warmer temperatures and more sun comes the return of the flies, looking for places to eat and lay their eggs. They can be a real nuisance for horses, so make sure to keep everything around your horse meticulously clean. Keep manure away from their stall or pen, since it will attract flies, and try to keep damp areas to a minimum, as flies like to breed in damp places. They become even more of a nuisance as spring turns to summer, so clamping down on breeding hotspots can only be beneficial. Set up fly traps around your horse’s stall, and try using a fly blanket to keep flies off the horse’s coat, and a fly mask to keep them away from their eyes. Finally, make sure to have a good check of all of your tack and equipment – and to do some spring cleaning! If your horse has been wearing a blanket throughout the winter, it can be tempting to just throw it in a forgotten corner somewhere until next autumn and winter, but this is a temptation that you should resist. A dirty blanket will be a magnet for bacteria and mould, so put it in the wash before storing it for next year, or throw it out and replace it if it’s too badly worn. Check your tack for any signs of wear and tear, as it could have been affected by the cold winter temperatures. Look over halters, saddles, bridles and other equipment for weak buckles, worn or cracked leather, rusted metal parts, worn Velcro and any other functionality issues. Now is also a good time to give your stables and yard a spring clean. Remove any matting and use a pressure washer and a good disinfectant to wash down the floor and walls, and give the matting a good wash as well before re-laying. We hope these tips are of some use to you. If you have any tips that you would like to share with us, please let us know on our Facebook and Twitter pages! To learn more about Racehorse Rescue Centre click here. If you would like to donate to our cause please click here.